We all have flaws, even popular movie stars have flaws. But they are fortunate enough to have professional makeup artists to help them out, but the rest of us are on our own. Luckily you can learn different makeup techniques to help cover your double chin. 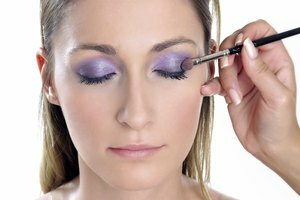 Contouring is a makeup trick used to minimize areas that you want to detract from. Then you can apply makeup to areas that you wish to maximize to draw attention even further away from your double chin. Clean your face and chin area. Always apply makeup to clean skin. Lightly pat your skin dry and apply a thin layer of oil free moisturizer on your face and all along your chin and neck area and let it absorb for a minute. Apply your regular foundation on your face, but to cover up your double chin, use a foundation that is one to two shades darker than the face foundation on your chin. Be careful that it is not too dark or it will end up looking like you are trying to grow a beard. Blend well so there are no demarcation lines. Brush a powder bronzer subtly all along the jaw line from ear to ear. Choose a gold-toned bronzer if you have medium to dark skin or a rose-toned bronzer if you have fair skin. Make sure it is blended well so that you do not see a line. Remember to keep it on your jaw bone line only. Sacha Cosmetics, the official makeup for The Miss USA and Universe Pageants says you can choose a bronzer instead of blush for a warm glow. To bring your look together and make it more natural looking, use the same bronzer on your cheekbones as blush. Bear in mind that to disguise your double chin, you need to give the illusion of light and shadow. Blend your bronzer well; you are creating an illusion, so you do not want to see any visible lines. Use a thicker brush on your bronzer when you are done with your jaw line to make it more subtle. Finish your look by dusting on some translucent face powder to set your foundation and bronzer. Create attention-getting eyes to draw the attention away from your double chin. Always use black mascara no matter what your skin coloring is. Celebrity makeup artist Jake Bailey says that every woman should have a rich black mascara on hand at all times, and it is the number 1 tool to create fabulous eyes. Experiment with different shades of eye shadows and colored liners to find what colors work best for you. Play up your eyes and not your lips, wearing bright lip color will draw too much attention to the lower area of your face, which is too close to the double chin you are trying to minimize. Use neutral shades of lip color instead. Always use a light touch with your bronzer and foundation, your goal is to keep it natural looking. Wearing your hair in an updo can give the illusion of a longer neck. Never wear high collars or turtlenecks.